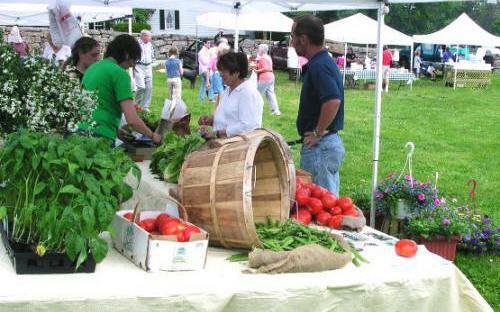 Fresh vegetables galore will be on sale at Lyme Farmers Market this Saturday. The Lyme Farmers Market is open for the final time in 2018 today from 9:30 a.m. through 1 p.m. at Ashlawn Farm in Lyme. It is the only market in New London County to be held on a working farm and its mission is to promote sustainable agriculture with locally-grown and -produced food, crafts, and specialty products. Vendors from the past 15 years will be present, along with several new ones. Market-goers will enjoy high quality organic produce, along with baked goods, seafood, meats, wine, and handcrafts. There will be live music by the Arrowhead String Band comprising Matt and Karen on guitars, Patricia on bass, and Leif Nillsson on banjo. This weeks guest vendors include BeBo Beverage on the field with nourishing Kombucha and Treefort Naturals with natural soaps and balms. Lyme-Old Lyme Education Foundation will be signing folks up for their upcoming benefit race. Good vibes will be on hand with bead jewelry and tie dyed items from Moxie & Mission. Stone bowls and birdbaths will be for sale by Marc Evankow. 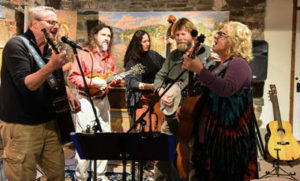 Arrowhead with Leif Nillsson on banjo will perform at the market, Saturday. The market is a non-profit entity, able to accept contributions and apply for grants to promote sustainable agriculture. Market master Steve Evankow and the LFM, Inc. board have worked hard all winter to revitalize the market. as a result, we will open with a full field of vendors. Your favorites will be back, plus some new seasonal and guest vendors. As usual, parking is free and plentiful. See you on the field!